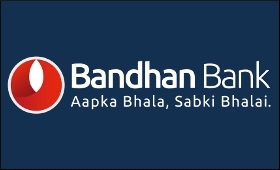 Bandhan Bank on Wednesday reported a 47.4 per cent increase in its net profit to Rs 488 crore for the quarter ended September 30, 2018 as compared to Rs 331 crore in the corresponding quarter of the previous year. Net Interest Income (NII) for the quarter grew by 55.6 per cent at Rs 1,078 crore as against Rs 693 crore in the corresponding quarter of the previous year. Total advances (on book and off book) increased by 50.9 per cent at Rs 33,373 crore as on September 30, 2018, against Rs 22,111 crore year-ago and total deposits, by end of September, was at Rs 32,959 crore, up by 29.6 per cent from Rs 25,442 crore at the end of September quarter last year. Commenting on the performance, the bank's Managing Director and CEO Chandra Shekhar Ghosh said: "The second quarter of FY 2018-19 continues to be promising with advances growing year-on-year by 51 per cent and CASA ratio of 36.9 per cent. We expect the momentum to continue in second-half of the current fiscal." Gross NPA, by the end of quarter under review, was at 1.3 per cent and net NPA at 0.7 per cent. The lender's banking network consists of 938 branches and 3,010 doorstep service centres. Notably, the Reserve Bank of India (RBI) recently withdrew its general permission to open new branches and froze the remuneration of the lender's MD and CEO till further notice as it failed to comply with a licensing condition. The Bank, however, can open branches with prior approval of the central bank.